One defining characteristic of autocratic systems throughout history, government and corporate, is the response to dissent of any kind. It is not to be tolerated, it is to be crushed, threatened, bullied, sanctioned, its perpetrators punished unreasonably. In contrast a democratic and civil organisation not only tolerates dissent, it is encouraged. Well, to some extent. Think of those politicians who seek their own satirisation in cartoons, even buying the originals for the walls of their palatial pads. That is the context of a healthy and thriving society. So what has been the late reaction of the SMT to this humble blog and its criticisms and humorous excursions on Kingston University’s dismal management (after four years of existence)? Like that of the autocrats, according to comments circulating around the University. In Stalinist form, they have threatened anyone contributing to Dissenters Blog with the sack. The SMT has demanded that the UCU disown it. 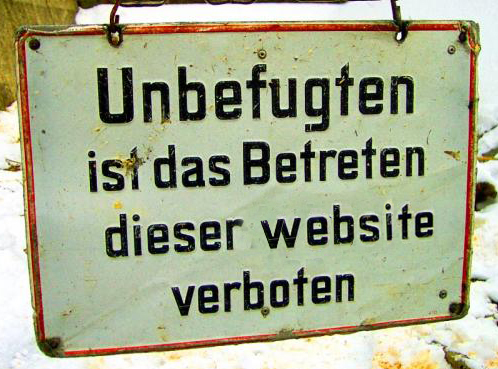 In management’s eyes you are probably a criminal for visiting this site. You have committed a reading crime; your thoughts are corporately impure. So it’s off to the gulag with all of you. Healthy and thriving Kingston University is not, and we all know the reason for that — all except our infamous senior management. What would be the sensible response to this blog? The most sensible would be to take heed of the criticisms, as well as those implied in the staff survey, comments at meetings by those who dare, and so on. If the members of the SMT are unable to do this, the second most realistic response would be none at all. Ignore it; wear a fatuous grin and pretend it isn’t happening, as Peter Cook once said of the incumbent Prime Minister. The worst reaction of all is the one they’ve made, insulting all the staff (yet again) and making absurd threats they could not possibly execute without legal action and terrible publicity. And the notion of telling staff what not to do in a university shows how far the notion of academic freedom has collapsed. One may speculate on who is the source of these SMT ructions. Could it be Simon Stoned, the non-academic shipped in to make a bigger mess from the mess left behind by past managers? The Management seems incapable of seeing where the problems with KU lie. Yes, they’ve dumped a few of its hopeless members but merely replaced them with others equally hopeless. Meanwhile the beleaguered staff continue to receive the blame, and now so does this blog. No, not the blog nor the staff are the problem SMT if you’re reading this. The blame lies squarely with you. sir humphery appelby would be so proud. I on the other-hand am profoundly distressed as i learn of the demise of what was the 5th best geology department in the uk, with arguably some of the best geologhy academics going, all of course blamed on students, standards, and staff not of course short sighted illconsieved false cost cutting and restructuring. Prof Steven Speir – it is time you listened to the complaints of your staff and sack senior management and Professors if they cannot do their jobs well, if they abuse or exploit staff, if they lie, if they break codes of conduct, policy & procedure. Listen to the people who work for you and the ones who have left. LISTEN! Stop allowing these overpaid fools to get away with abuse and exploitation. Be moral. Be ethical. Be the leader we need you to be. The Corporate mindset that now dominates the KU mis-management hates this blog precisely because it forces them to face uncomfortable truths. They would much rather bury their heads in the sand, issue bland press releases, and pretend everything is rosy and bright. The genuinely dedicated staff lower down know the hard reality. Excellent work, Dissenter! This blog is clearly exposing the disgraceful practice and actions of the SMT (and also their enforcers, HR). The Machiavellian SMT evidently do not like their misdeeds exposed – and it is causing some discomfort. Efforts must therefore be redoubled! One wonders whether the Board of Governors will ever do the right and decent thing and sack the entire SMT, who are not fit for purpose – before the Uni does a Titanic. With their increasing threats agaunst dissent, it is avshame staff and UCU do not collectively pass a motion (no pun intended) of no confidence in the SMT shower, forcing their departure. Those who have had their careers damaged by bullying and garassment could also turningvthe tables on their SMT abusers and mount joint, class actions against them. Let us rid the academic world of this parasitical scourge.